After 35 days, the longest government shutdown in American history is over. Late into the night on January 26, the House and the Senate overwhelmingly passed legislation to fund the government for the next three weeks, with President Trump temporarily caving on his demand for border wall funding. The last 24 hours of the shutdown were a whirlwind, starting with back-to-back votes in the Senate on January 25th. For the first time since the start of the shutdown, Senate Majority Leader Mitch McConnell accepted to hold a vote to reopen the government. The Senate voted on two different spending bills, which both failed to reach the required 60-vote threshold. The first bill included funding for the wall, in exchange for temporary protection for DACA recipients. This bill, which was brought to the floor by McConnell, resulted from a proposal made by President Trump this weekend. House Speaker Nancy Pelosi had already rejected the offer, which made it unlikely Democrats would vote for it. In the end, 50 Senators voted for, and 47 against. Senator Joe Manchin (D-WV) was the lone Democrat to vote for Trump’s proposal, while Republican Senators Tom Cotton (R-AL) and Mike Lee (R-UT) voted against it. The second bill was a spending bill introduced by Senate Minority Leader Chuck Schumer (D-NY) that temporarily funded the government for three weeks and did not include money for the wall. While this bill also failed to pass, it received more bipartisan support. All the Democrats voted for the bill, and so did six Republicans. It is surprising that this bill failed to pass, considering it was nearly identical to a bill that passed the Senate unanimously just before the start of the shutdown, back in December. After the back-to-back failed votes in the Senate, combined with Trump’s reiterated support for the wall, there was little hope that the government would reopen soon. However, not even 24 hours later, the shutdown was over. Many Republican Senators had grown increasingly frustrated with the GOP leadership over the shutdown because they did not see the need to shut down the government over the wall proposal. In the House, a few Republicans had voted with the Democratic majority on spending bills that did not include wall funding. In the Senate, six Republicans voted for the Schumer proposal, and two voted against the Trump proposal. 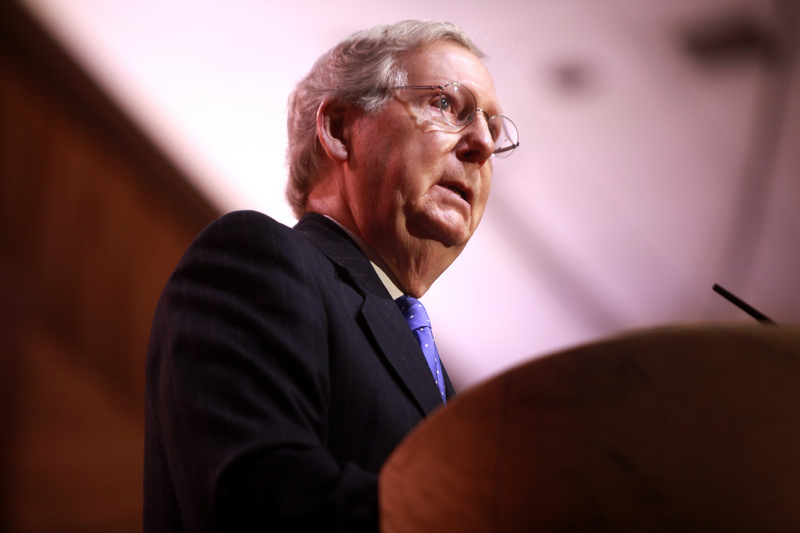 Furthermore, there were reports of a chaotic meeting between Republicans before the vote on Thursday, where some Senators confronted Mitch McConnell and blamed him for the shutdown. Many missteps of Trump’s entourage also did not help to keep the GOP caucus united. Trump’s daughter-in-law claimed that the shutdown is only “little bit of pain” for federal workers who have now missed two paychecks, and Wilbur Ross, the Commerce Secretary, suggested that federal workers get a loan instead of going to food banks. Ross’ comments angered Lisa Murkowski (R-Alaska), who claimed that he was “clearly out of touch” and his comments were “disconnected from reality.” Later that day, Murkowski was one of the six Republicans who voted for the Schumer proposal to reopen the government. On the other hand, the Democratic caucus stayed united throughout the shutdown, with Senator Manchin being the sole defector in the Senate. Pelosi reiterated many times that she would not bring to the House floor any legislation that included wall funding, including what she describes as a “down payment” for the wall. It was clear that the Democrats would not cave on any of Trump’s demands. Furthermore, public opinion was largely on their side. According to multiple polls, a majority of Americans do not support the border wall and blame Republicans and President Trump for the shutdown. The straw that broke the camel’s back came Friday morning. As 800,000 federal workers missed their second paycheck due to the shutdown, the Federal Aviation Administration halted flights at New York’s LaGuardia Airport for more than an hour, because not enough air traffic controllers had shown up to work. Other major airports, like Newark and Philadelphia, were also affected by this temporary halt. A potential large-scale disruption of air travel in the country loomed over lawmakers if they failed to reach a deal to end the shutdown. By then, Mitch McConnell had already told Vice President Mike Pence that he did not know how long he would be able to keep more GOP senators from breaking with the party and voting with Democrats to end the shutdown. President Trump reached out to McConnell and agreed to support legislation to temporarily reopen the government. On Friday afternoon, Trump announced it to the press, and the government had reopened by Friday night. The government is now back where it was a month ago, before the shutdown. There is still no agreement on long-term legislation to keep the government open for the year. The Democrats are still not in favour of the wall, and President Trump continues to believe that it is necessary. All parties involved now have three weeks to come up with a compromise on border security. If this does not happen, which is the more likely scenario, there risks being another shutdown after February 15th. For the sake of the hundreds of thousands of federal workers who have not received paychecks for the past month, let’s hope the government will stay open for more than three weeks.